While there is no shortage of debate on Measure S, the public dialogue has been relatively uninformed about the likely consequences of the Measure, in part due to difficulties in working with the various data sources on permitting and housing construction in Los Angeles. In this brief, our best assessment of the available research and data leads us to conclude that if the Measure passes, rents and property costs in the Los Angeles region are likely to rise even faster than they are already. 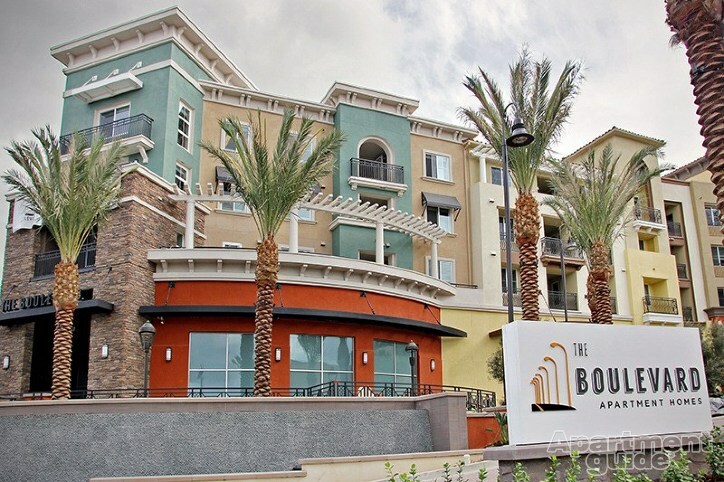 Longstanding conflicts over development have come to a head in Los Angeles. Measure S, on the Special Election ballot on March 7, 2017, proposes substantial changes to zoning and development policies and processes in Los Angeles. This issue brief deals predominantly with the likely consequences of: (1), the moratorium, and (2) the prohibition on spot zoning; and briefly discusses (6) the prohibition on parking variances as it relates to affordable housing developments. The impacts of components 3, 4, and 5 are better-understood, and moreover, as of February 8, 2017, the City Council has already adopted changes to the development process that align with these components of Measure S.
Our best assessment of the available research and data leads us to conclude that each of the three components under examination in this brief are likely to raise the cost of housing in the region. In other words, rents and property costs – already at historic highs for the region, and higher than all but a few markets in the country – are likely to rise faster if Measure S passes. Broadly, this is because each of these three proposed rules has the effect of restricting the supply of housing. Measure S, if passed, would halt for two years any development requiring a Zone Change, Height District change, or General Plan Amendment. Proponents of Measure S have argued that the planning process relies too heavily on ad-hoc, discretionary actions and nefarious back-room negotiations between council members and developers. It is indeed the case that the planning process in Los Angeles stipulates a complex set of political transactions. The many forms of discretionary actions have accreted to a sometimes negotiable and often unpredictable entitlements process. While the Measure S proponents are correct to point out the overuse of tools designed for occasional application, a simple ban on their use fails to address why these tools are so relied upon. 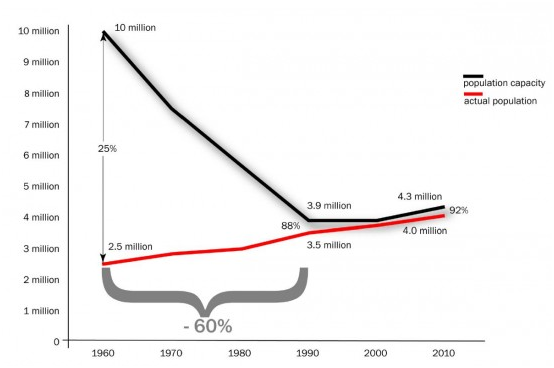 Zoned housing capacity has been on a steady decline for 55 years in Los Angeles (Figure 1.). With less capacity to build by-right, such exceptions have become increasingly necessary to build meaningful numbers of housing units. If Measure S passes, how many housing units would be prevented from being built? And where in the City would they be located? 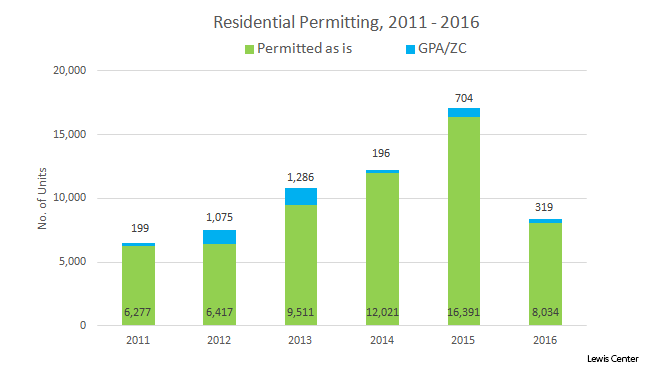 To answer these questions, we examined the projects that were granted at least one of these exceptions using data on the past five years (2011-2016) of approvals and permits (Figure 2). The public debate on the likely effects of this component of the measure has been relatively uninformed due to the challenges involved in working with this data – specifically, reconciling a persistent time lag between the city’s disparate databases for zoning approvals and building permits. Our conservative estimate is that at least 9% of all units that received a Certificate of Occupancy between 2011 and 2016 necessitated use of these exceptions. But the number could be as high as 27%., Nine percent may seem low, suggesting Measures S would be low impact, but the Zone Changes and General Plan Amendments are used predominantly for large-unit projects: 80% of the 70 projects built in this manner between 2011 and 2016 contained 5 units or more. So the evidence indicates that these exceptions are important tools to build higher density. We included example projects (Figures 4 & 5) that would not be built had Measure S been in effect when these projects went through the development pipeline. Replaced an under-utilized church on blighted vacant land and added 77 affordable family homes for 240 low-income people (would not have been allowed under Measure S). Former site of the modernist Valley Music Theater building, long used as a Jehovah’s Witness Regional Assembly Hall, is now home to 340 market-rate condos and “live+work” lofts (would not have been allowed under Measure S). 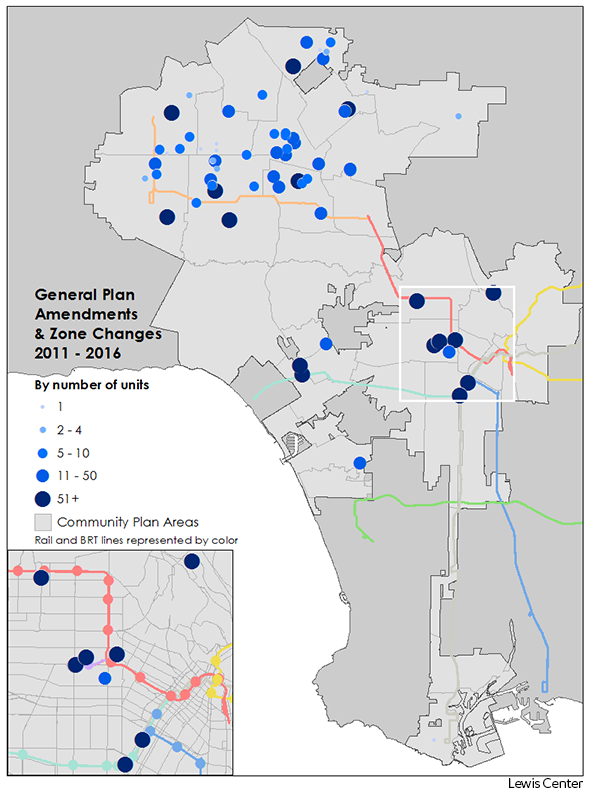 In terms of location, the use of these amendments is concentrated in the San Fernando Valley where most plans are over fifteen years old (Figure 7). Projects that rely on these exceptions also tend to be located near rail transit, which is particularly true of the larger projects (Figure 8). This pattern suggests that General Plan Amendments and Zone Changes are not just tools for creating density, but are being used deliberately by planners striving to meet the city’s Transit Oriented Development goal of “highly accessible housing”. Even if all 35 Community Plans could be updated rapidly, this would be unlikely to solve the fundamental problem of a lack of zoned housing capacity. Slow growth advocates have largely succeeded at fighting growth on the battlefield of these community plans in the past and will likely continue to do so. While it is good governance to build only what is agreed upon in these Community Plans, without a pro-growth movement or elected leadership pushing to write more density into the plans, Community Plans are likely to remain a tool to stifle growth. Some of the marketing in support of Measure S implies that new housing is expensive and set-aside for the wealthy. True or not, new housing, even luxury, is crucial to the overall affordability of the housing supply. Research shows that new, high-end housing attracts high-income households, freeing up older, existing units, which then filter to lower income households. By simply disengaging space, new expensive units facilitate housing access and can improve overall housing affordability at the regional level. More generally, extensive research on land use regulations shows that housing markets that are more responsive to demand changes (due to fewer land use regulations) experience less price growth. In a successful Measure S scenario with no new housing, high-income residents would hold onto older, existing units that would otherwise be utilized by middle-income households. Those middle-income households would compete for the low-end of the housing market, and low-income families could be shut out altogether. On this point, research from California’s Legislative Analyst’s Office shows a link between increased construction of market–rate housing and reduced displacement. As market–rate housing construction tends to slow the growth in prices and rents, it can make it easier for low–income households to afford their existing homes, lessening the risk of displacement of low–income households. 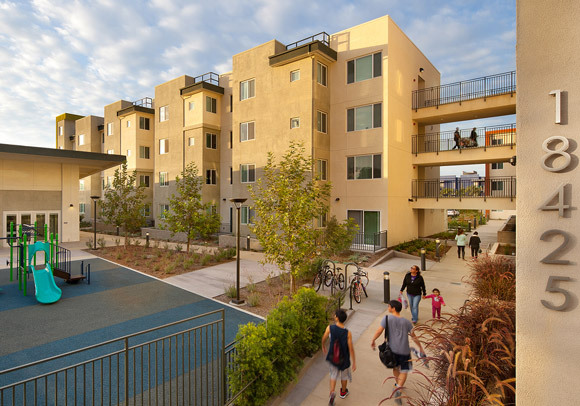 Similar research finds that both market-rate and subsidized housing reduce displacement pressures, with subsidized housing showing over double the positive impact of market-rate units. Given these fundamental dynamics, Measure S’ two-year construction ban will likely escalate the pace of displacement of low income residents. The Measure S Coalition maintains that affordable developments are exempt from the Measure. This is not true. The measure exempts 100% affordable projects from the Height District or Zone Change prohibitions, but not the prohibition on General Plan Amendments. Realistically, if a project needs a Zone Change, it may need a General Plan Amendment as well. In any case, aside from the occasional supportive housing development or senior housing, there is virtually no such thing as a 100% affordable project. Low rents make it nearly impossible for the developer to recover costs, which is why the vast majority of affordable housing projects contain at least 20% market rate units. Any 100% affordable project on the market was built by a mission driven nonprofit with deep public subsidies. 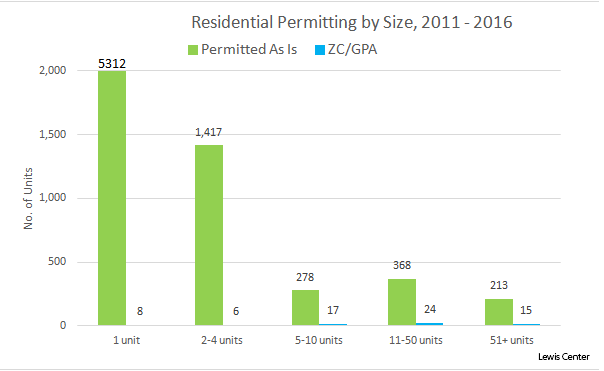 The measure also limits the use of parking variances, one of the most important tools for building affordable housing. If Measure S passes, the bottom line is that very little affordable housing will be built for the foreseeable future. 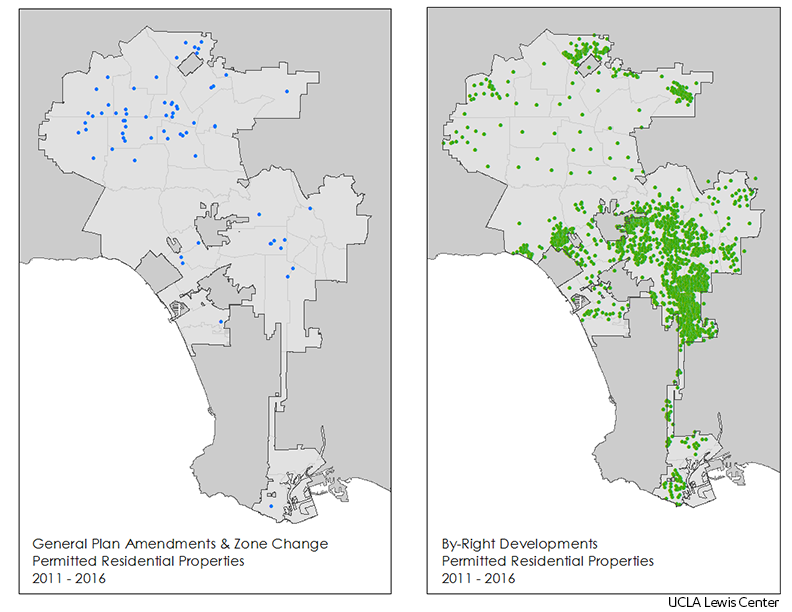 It is indeed a problem that housing production in Los Angeles depends so much upon ad-hoc and discretionary processes like Zone Changes and General Plan Amendments. They can make it difficult for residents to anticipate neighborhood change and the frequent development deal-making concentrates power in the hands of City Council members where development outcomes often hinge on favorable campaign donations. Measure S proponents have rightfully criticized this situation. At the same time, however, Los Angeles is in an increasingly dire housing affordability crisis, and the only real solution to that crisis is to build more housing. In order to do that without relying upon amendments and spot-zoning, the City needs to systematically upzone, and relax or remove parking requirements. A real solution would include those elements in order to protect housing affordability. Without a vision for a denser Los Angeles where it is easier to build housing, Measure S promises nearly certain increases in rents and property costs. Michael Lens is the associate faculty director of the Lewis Center. Kate Traynor, Michael Lens, Madeline Brozen, and Herbie Huff contributed to this brief. View coverage and a video from the Lewis Center’s Measure S Event. PLANNING AND LAND USE MANAGEMENT COMMITTEE REPORT. Rep. no. 16-0422. N.p., n.d. Web. 17 Feb. 2017. <http://clkrep.lacity.org/onlinedocs/2016/16-0422_rpt_plum_1-31-17.pdf>. ; RE: CF-16-0422 -COMMUNITY PLANS, GENERAL PLAN AMENDMENT BATCHING, EIR CONSULTANTS. Rep. City of Los Angeles, n.d. Web. 17 Feb. 2017. <http://clkrep.lacity.org/onlinedocs/2016/16-0422_misc_01-27-2017.pdf>. Morrow, Greg. “The Homeowner Revolution: Democracy, Land Use and the Los Angeles Slow-Growth Movement, 1965-1992.” Diss. U of California at Los Angeles, 2013. Abstract. N.p., 2013. Web. <https://escholarship.org/uc/item/6k64g20f>. Measure S Economic Policy Analysis. Rep. Beacon Economics, Dec. 2016. Web. 17 Feb. 2017. <http://www.goestoofar.com/text/MeasureS_EconPolicyReport.pdf>. Original analysis based on data from the Los Angeles County Department of Public Health – Health Impact Evaluation Center which combined LA Department of Building and Safety database with LA Department of City Planning database. Due to possible matching errors, figures should be considered estimates. Developing and Implementing the City of Los Angeles’ Transit Corridors Strategy Coordinated Action toward a Transit-Oriented Metropolis. 1 Oct. 2012, planning.lacity.org/policyInitiatives/TransitOrientedDistrictPlanning/LATransitCorridorsStrategy_WhitePaper%20Final%20(2012-10-01)%20Carlton.pdf. 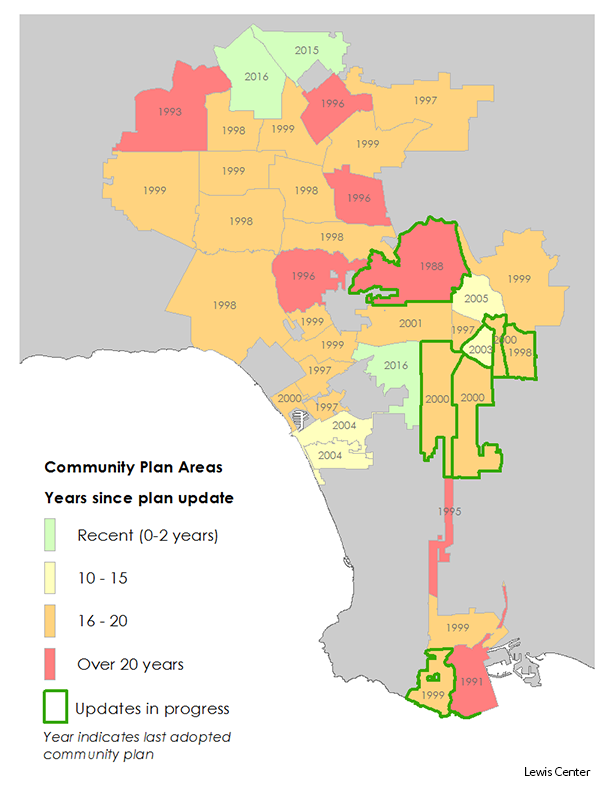 “Community Plans Adoption Status.” Adoption Status: Community Plans, Area Planning Commission, 2 Sept. 2003, planning.lacity.org/complan/Cpupage.htm. Accessed 17 Feb. 2017. “Public Participation in the Community Planning Process.” N.p., n.d. Web. 17 Feb. 2017. <http://planning.lacity.org/PublicPartGraphic.html>. Kudler, Adrian Glick. “NIMBYs Win Battle Against Transit-Friendly Hollywood Growth.” Curbed LA. Curbed LA, 11 Dec. 2013. Web. 17 Feb. 2017. <http://la.curbed.com/2013/12/11/10165154/nimbys-win-battle-against-transitfriendly-hollywood-growth>. Rosenthal, Stuart S. (2014) Are Private Markets and Filtering a Viable Source of Low-Income Housing? Estimates from a ‘Repeat Income’ Model. American Economic Review 104(2): 687–706. Glaeser, Edward L., Joseph Gyourko, and Albert Saiz (2008) Housing Supply and Housing Bubbles. Journal of Urban Economics 64(2): 198-217. ; Saiz, Albert (2010) The geographic determinants of housing supply. Quarterly Journal of Economics, 125(3), 1253–1296. ; Quigley, John M. 2007. “Regulation and Property Values in the United States: The High Cost of Monopoly.” Berkeley Program on Housing and Urban Policy, Institute on Business and Economic Research. ; Glaeser, Edward, and Joseph Gyourko. 2002. Zoning’s Steep Price. Real Estate Brief, Washington DC: The Cato Institute. ; Glaeser, Edward, Raven E. Saks, and Joseph Gyourko. 2005. “Why Have Housing Prices Gone Up?” American Economic Association – Papers and Proceedings 329-333.; Ihlanfeldt, Keith R. 2007. “The effect of land use regulation on housing and land prices.” Journal of Urban Economics 420-435. Kok , Nils, Paavo Monkkonen , and John M. Quigley. 2014. “Land use regulations and the value of land and housing: an intra-metropolitan analysis.” Journal of Urban Economics 136–148. “Perspectives on Helping Low-Income Californians Afford Housing.” LAO, 9 Feb. 2016. Web. 17 Feb. 2017. <http://www.lao.ca.gov/Publications/Report/3345>. Zuk, Miriam and Karen Chapple (2016) Housing Production, Filtering and Displacement: Untangling the Relationships. University of California Institute of Governmental Studies Research Brief. Manville, Michael, and Donald Shoup. “Parking requirements as a barrier to housing development: regulation and reform in Los Angeles.” EScholarship. University of California Transportation Center, 1 Feb. 2010. Web. 17 Feb. 2017. <http://escholarship.org/uc/item/1qr84990>. ; “Reducing Housing Costs by Rethinking Parking Requirements.” SPUR. N.p., 1 June 2006. Web. 17 Feb. 2017. <http://www.spur.org/publications/spur-report/2006-06-01/reducing-housing-costs-rethinking-parking-requirements>.